Cindy Aguilar- Castaneda, a senior at Gonzales High, was chosen as one of two California representatives for the Hearst U.S Senate Youth Program in Washington D.C. Thank You Roberto A. Ochoa-Perez for Saving a Teacher's Life!!! 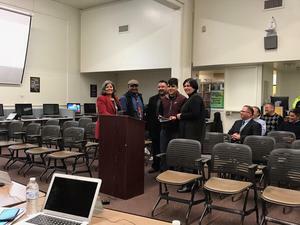 Roberto was acknowledge by the Gonzales USD Governing Board at their Regular Meeting on January 28, 2019 for his willingness to help and ability to stay calm in a very intense situation. Thank You Joe A. Pacheco for Your 34 Years of Service to Gonzales USD! 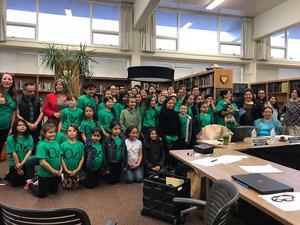 / ¡Gracias Joe A. Pacheco por sus 34 años de servicio al distrito escolar, Gonzales USD! 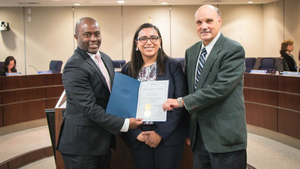 Mr. Pacheco received recognition at the December 10, 2018 Regular Board Meeting. / El Sr. Pacheco recibió reconocimiento en la reunión regular de la Mesa Directiva el 10 de diciembre, 2018. Hartnell College Academic Counselor coming to GUSD!